← Invitation To The @Mr_Pasadena Tequila Tweet Up. 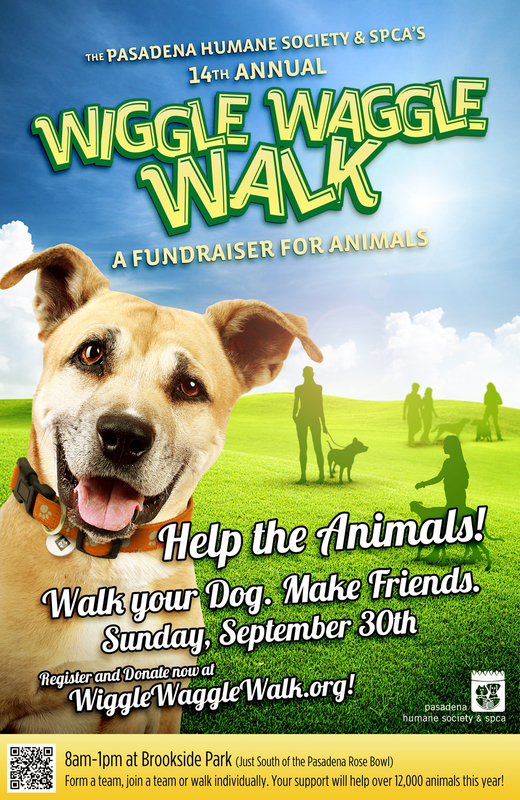 – The Pasadena Humane Society & SPCA invites animal lovers to put their best feet forward on Sunday, September 30 during the shelter’s 14th annual Wiggle Waggle Walk – A Fundraiser for the Animals at Brookside Park adjacent to the Rose Bowl. Organizers hope to raise $300,000 through the event, which will provide food, shelter and medical care to homeless animals; nearly 12,000 of which are taken in by the humane society every year. Some 2,000 people and their dogs are expected to take part in the walk, which begins at 9 a.m. Walkers and their dogs can choose either a one-mile or three-mile route around the outside of the park before enjoying a free Fair & Pet Expo. Participants do not need a dog to join the fun—just a desire to help animals—and they can walk individually or form teams. Registration is free, but participants are encouraged to fundraise for the animals by creating personal web pages through the Wiggle Waggle Walk website and asking family, friends and co-workers for donations. Non-walkers, and those unable to attend the event, can also create fundraising web pages through this site. Entrants who raise $50 receive an official Wiggle Waggle Walk T-shirt. Check-in starts at 8 a.m. at the entrance to Brookside Park in Parking Lot I. The walk will begin at 9:00am and the Fair & Pet Expo will take place immediately after the walk until 1 p.m. The Fair will feature Muttley Crew’s dog agility show, K9 demonstrations by the Pasadena and Glendale Police Departments, a variety of pet product booths, paw-tapping music, and fun dog contests. This year’s sponsors include Wells Fargo, VCA Animals Hospitals, Community Bank, Stumbaugh & Associates, Guess, Eye Care for Animals, TLCPetMedicalCenter and Three Dog Bakery. For more information call (626) 792-7151 ext. 167 or visit www.wigglewagglewalk.org. Founded in 1903, the Pasadena Humane Society & SPCA is an open door agency that welcomes and cares for all animals in its service area regardless of any criteria. The agency provides essential animal welfare services and animal control for its seven service cities: Arcadia, Glendale, La Cañada Flintridge, Pasadena, San Marino, Sierra Madre and South Pasadena. Public spay/neuter and vaccination clinics, behavior and training classes, adoptions, as well as humane education are provided to strengthen the animal-human bond and keep pets in their homes. For more information, visit www.pasadenahumane.org. Mr. Pasadena's Blogroll - these bloggers rock!